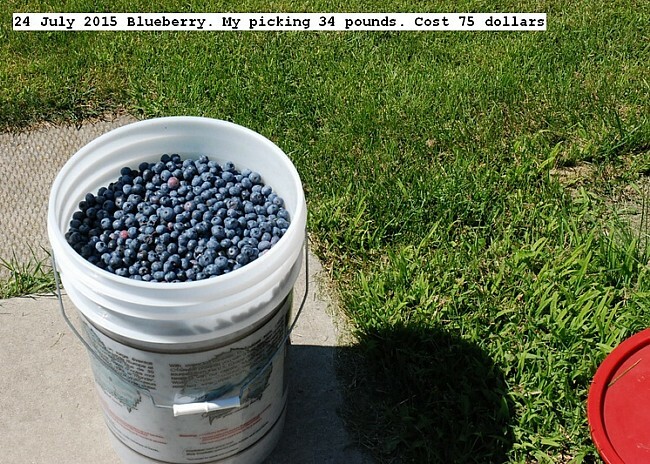 Thirty four pounds of blueberries were picked from a grower and processed into twenty five liters of juice. The cost of berries was $2.25 per pound. Each liter of juice used 1.36 pounds of berries for a cost of about $3.00 per liter.Blueberries have almost no gross fiber so elaborate straining is not required. In fact, they could probably be beat into a slurry then canned. My berries were cooked, beat into a slurry, strained using a Victorio Juicer, pressured canned in liter jars at 15 PSI for 15 minutes for storage.Annotated pictures depict the process. This entry was posted in Uncategorized and tagged Blueberry Juicing.. Bookmark the permalink.